As a labour economist, I have been investigating youth unemployment for many years. Back in 2000, I co-edited a book entitled Youth Employment and Joblessness in Advanced Countries, in which experts analysed the problems facing the youth labour market. The evidence from this book - and from a great deal of more recent work - is that the youth labour market is different from that of adults. These studies also made it clear that long spells of unemployment at a young age can create permanent scars. A number of other facts stand out. First, youth unemployment rates tend to be two to three times higher than adult rates. Second, youth joblessness is especially volatile, rising faster in a slump and declining more rapidly in a boom. Third, the size of the youth cohort matters: the more people there are chasing the jobs available, the higher the unemployment rate will be. Before the general election in May last year, youth joblessness in Britain, having worsened during the recession, was showing signs of improvement as a result of measures introduced by Labour and paid for by a tax on bankers. But no longer. The Justice Secretary, Kenneth Clarke, spoke of the "calamitous position" that we are in. Perhaps the phrase applies to young people more than to anyone else. George Osborne and David Cameron shake off the blame for rising youth unemployment by claiming that it has been a problem for some time and that we are still seeking an explanation for it. We are not. The answer is simple and has two different parts: for the years up to 2008, it has to do with the supply side (the number of workers); for the years since then, it is down to the demand side (the number of jobs). The main explanation for rising youth unemployment between 2000 and 2008 is on the supply side. The number of youngsters between 16 and 24 increased from about 6.26 million in January 2000 to 7.36 million in June 2009. It fell back slightly in November 2010, to 7.34 million. The blue line on the graph below plots the size of the youth population compared with the overall population; it rose from 13.6 per cent to a high of 14.9 per cent between June and August 2008 and has recently fallen back to 14.7 per cent. The pink line plots the youth unemployment rate, which increased steadily from 2003 to 2008. Because of the growing size of the cohort (partly the result of an inflow of young people from the EU accession countries), there were more people in the age range looking for work. The pool of jobs, however, was not growing fast enough. The graph shows that, since 2008, the size of the youth cohort has remained quite steady. If anything, it has begun to decrease as youth joblessness has exploded. The story for this later period is that there has been a decline in demand. As demand has collapsed, most of the workers from eastern Europe have left. The table below sets out the changes in the youth labour market between November 2007 (before the onset of recession) and November 2010, allowing us to compare the last seven months under Labour with the first seven months under the coalition government. 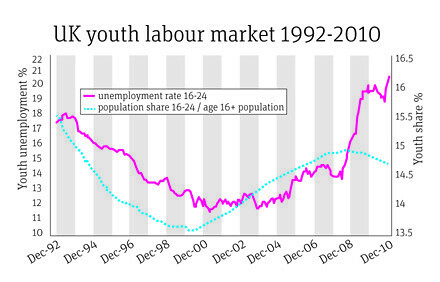 The data shows that the coalition has sent the youth labour market back into crisis. The main employed figure is the sum of workers who are not in full-time education and those who are in full-time education who also have a part-time job. The unemployed figure is the sum of those out of work who are not in full-time education as well as those who are but say they are looking for a part-time job. The labour force is the number of unemployed plus the employed, while the unemployment rate is the number of unemployed divided by the labour force. This stands at 20.5 per cent, up from 19.4 per cent in May 2010 and 14 per cent in November 2007. More than a quarter of a million young people currently without work have been unemployed for over a year. During Labour's last seven months in office, youth unemployment fell slightly while youth employment increased by 39,000. 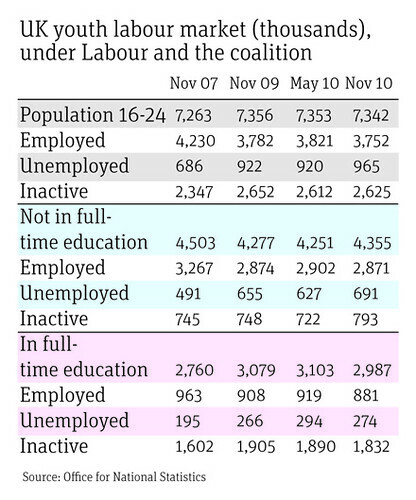 Under the coalition, youth unemployment has increased by 45,000 and youth employment has fallen by 69,000. Overall employment has in fact increased by 98,000, so the employment of older adults has risen by 167,000. Our labour market problem is thus primarily a youth problem. The increase in youth unemployment since May 2010 is entirely among those who are not in full-time education. Their numbers have increased by 64,000, compared to a fall of 20,000 for those in full-time education looking for a part-time job. The numbers in full-time education increased by 31,000 under Labour but have fallen by 116,000 under the coalition. Being in college is better than being on the street. The Future Jobs Fund (FJF) and the Education Maintenance Allowance (EMA) are being cut, as are university places, at a time when tuition fees are rising. Applications to universities through Ucas have risen by 180,000 - more than a third - since 2007 and almost as many applicants are likely to be disappointed this year. At the same time, further education colleges are preparing for severe cuts in funding and youth charities such as the Prince's Trust are reporting declines in donations. Charities are also facing a reduction in the level of government support, just when demand for their services is soaring - proof, if you needed any more, that Cameron's "big society" (BS) is guff. He has responded to criticism that his big idea is just a cover for cuts with yet more spin. "I was talking about social responsibility long before the cuts. Building a stronger, bigger society is something we should try to do, whether spending is going up or down." The British people - especially the young - know BS when they see it. To prevent a generation from being lost, the government must provide more places in education and training (including apprenticeships) and more jobs. The best way to create jobs is to give a two-year holiday on National Insurance payments for anyone under 25 and to scrap the planned rise in April. On top of this, the FJF and EMA should be reinstated. After all, it's not as if the coalition is averse to U-turns.